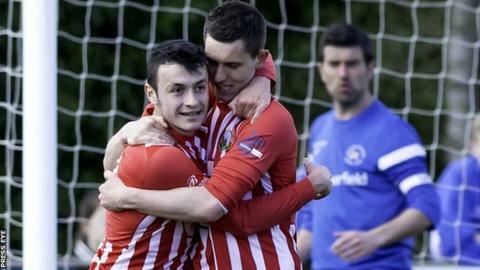 Ballinamallard United and Warrenpoint Town shared the points at Ferney Park. Liam Martin latched on to a clever John Currie through ball to score low into the corner in the 10th minute but Daniel Hughes netted a penalty on 19. Johnny Fraser stabbed home from two yards out on 28 minutes but Ryan Campbell lifted the ball over the goalkeeper in the 58th minute. Hughes made it 3-2 with a neat finish on the hour, then Steven Feeney rose highest to head in an equaliser on 84. Ballinamallard finish ninth, while Warrenpoint will play Bangor in a two-legged promotion/relegation play-off on Tuesday and Friday.